I‘m going to stray away from my typical style of introducing tourist spots in Taiwan and offer a bit of personal opinion about this specific place. If you aren't a fan of politics or history - just take a look at the pictures. I have degrees in International Development and East Asian Studies, so its only natural for me to offer a bit of perspective here to go along with the photos. There are mass plots of empty land somewhere in the deserts of Arizona called "boneyards" where retired jetliners go to be recycled when their time is up. If you've ever seen a picture of these airplane graveyards, they are massive and can almost be described as beautiful despite the fact that they are lined up in order to become nothing more than scrap metal. 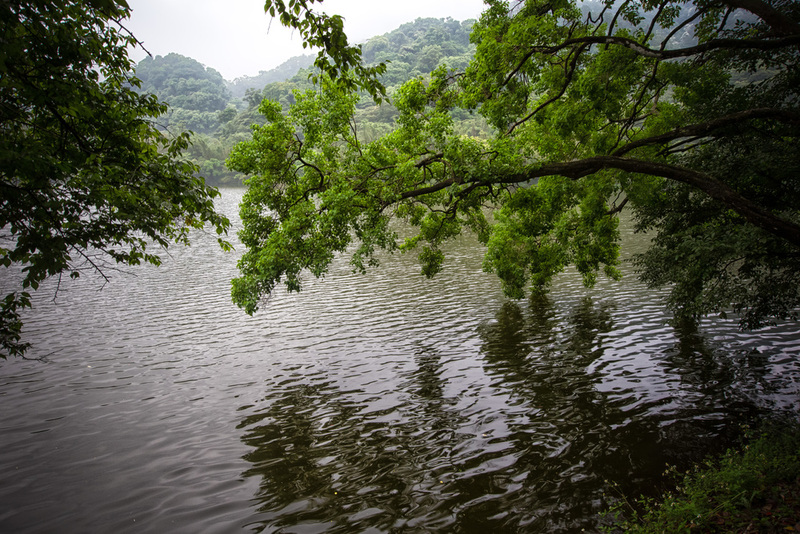 Cihu (慈湖) which translates as "benevolent lake" is a serene lakeside property near Daxi (大溪) in Taoyuan county that has assumed the unfortunate responsibility of becoming a "boneyard" of sorts, just like the ones you will find in Arizona. 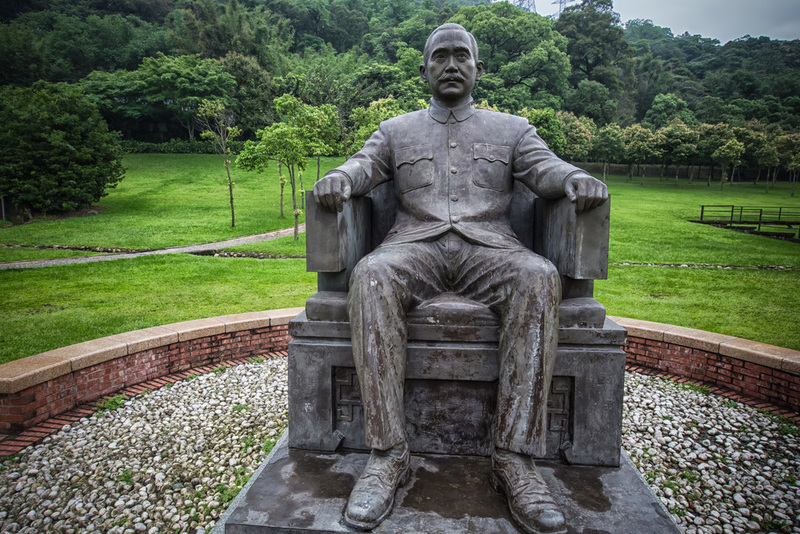 This particular boneyard however is dedicated to Generalissimo and former President of the Republic of China - Chiang Kai Shek (蔣介石) and the statues that he (like every other dictator before and after him) had fashioned in his image. The nicest part of the park? When Chiang died In 1975, it was his wish that his body be interned at this site until such a time that Republic of China forces could take back China by force and reinstitute his version of democratic rule over the oppressed people of Red China. The Daxi river valley area was always an area that the Chiang family was fond of, and both Chiang Kai Shek and his son Chiang Ching-Kuo (蔣經國) are interned within the village which has become known as a "town of presidents." Due to Chiang's wishes to return, his body was not prepared in traditional Chinese fashion and was thus placed in a black marble sarcophagus which was meant to preserve his body until it could be buried in his hometown in Zhejiang Province (浙江省) in China. It is now 2015 and his body has lain in state at Cihu for over forty years - The dream that his Chinese Nationalist Party (中國國民黨) would ever be able to retake his motherland has become an impossibility. The Taiwanese people have forged ahead with their own national identity while his life's work, the party he helped to create more or less grovels at the feet of the Communist leadership in China for scraps. What Chiang was unable to foresee before his death was that Taiwan would develop into a thriving multi-party democracy. The peace-loving people in the country completely disregarded his dream of taking back China from the Communists and forged ahead with mass development making Taiwan one of the most advanced nations in the world with a population that freely exercises its right to free speech and liberty. When free and open elections took place after the era of Martial Law was lifted, Chiang's KMT weren't to stay in power for long as people demanded change. Part of that change to put it simply was to deal responsibly with Chiang's legacy - Chiang and his regime were guilty of horrendous crimes committed against the Taiwanese people and despite efforts to develop the country, his legacy will always be a contentious one especially for those who lived through those terrible years known as the "White Terror" (白色恐怖) period. Chinese Tourists confused as to why they're at the park. 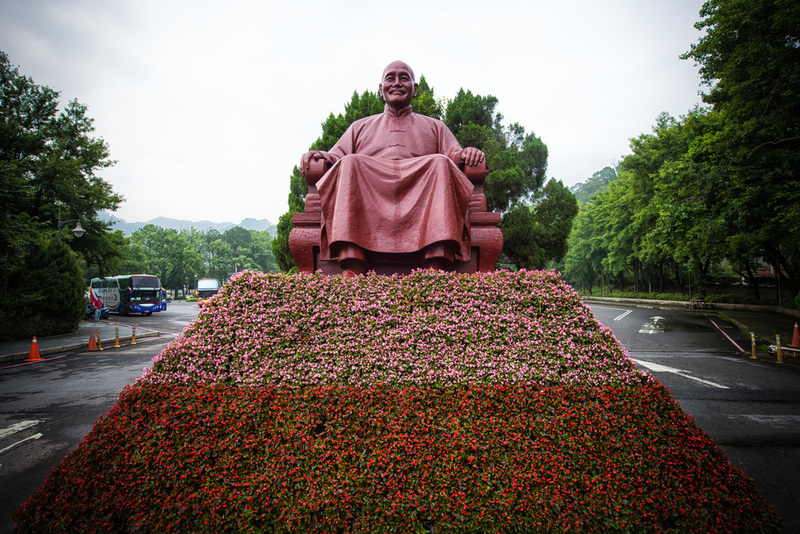 All in all there are over 43,000 bronze statues of Chiang Kai Shek (蔣公銅像) littered throughout the country. You can find them in front of schools, parks, military bases and government buildings. Despite a strong desire to remove them, up until now it seems that just over 200 have been moved to Cihu. 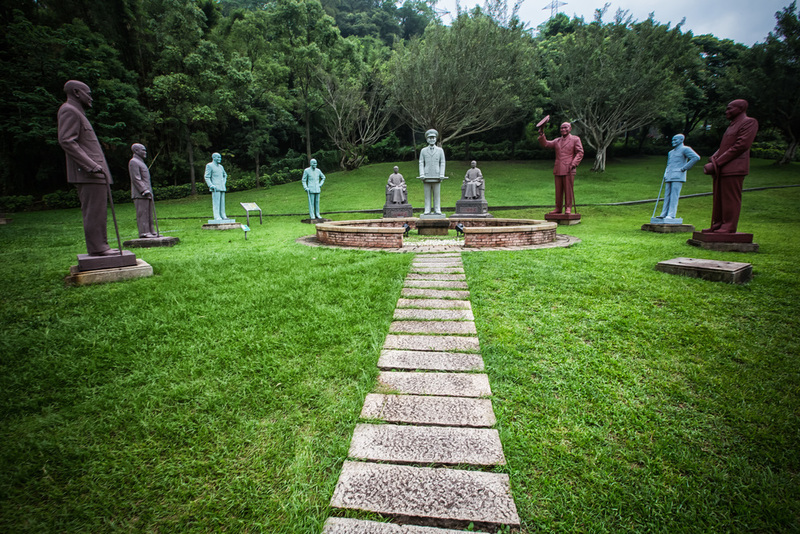 Moving the statues has become an issue almost as contentious as the man himself as supporters of the KMT show up to protest whenever a statue is to be removed causing logistical problems for lawmakers. When the KMT retook the presidency in 2008, efforts to remove the statues came to a standstill and the statues that hadn't been already removed were pretty much left were they were. 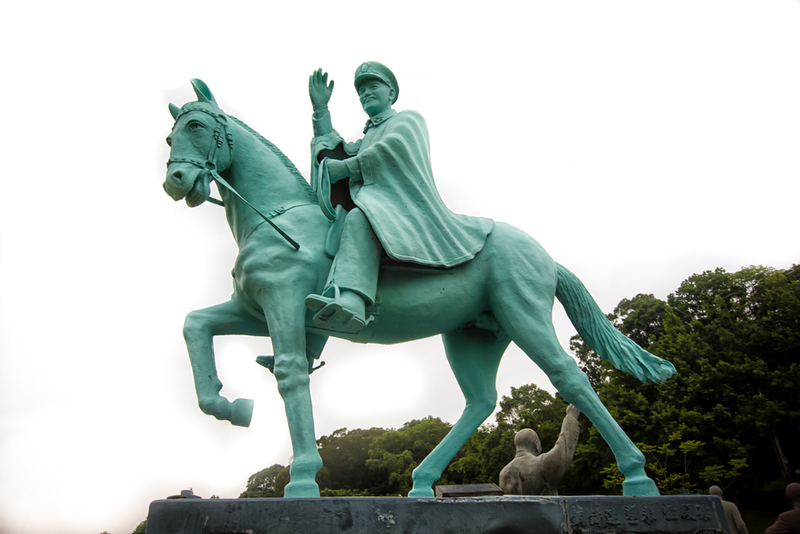 This inaction and lack of recognition by the KMT has led to issues of vandalism with some of the remaining statues being beheaded, spray painted and otherwise smashed to bits by people angry with the government or those had their lives adversely affected by the KMT or Chiang Kai Shek. These days the park has become somewhat of a tourist attraction, especially for those tourists coming from China. 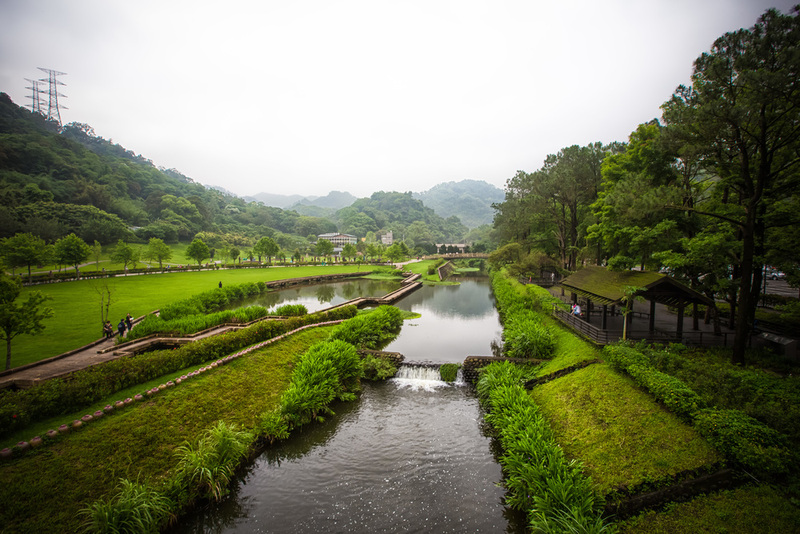 Tour buses full of people are carted to the countryside here in Taoyuan and unloaded at the park to experience a bit of modern "Chinese" history. While visiting the park, I watched quite a few of the Chinese tourists and it seemed like they were generally bored and confused as to why they were wasting their time at the mausoleum. Part of the problem of traveling in tour groups I suppose is that you sometimes have to do something boring even though there are much more interesting things to do while visiting a country. 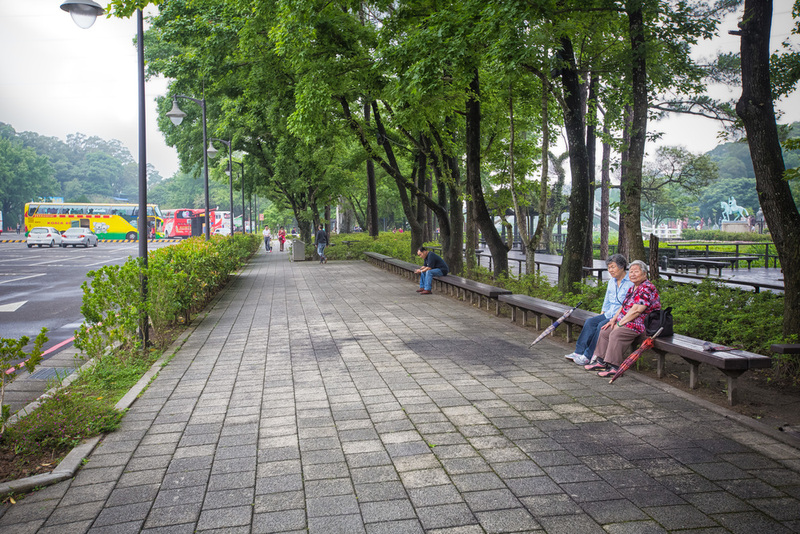 For Taiwanese visitors, the park seems to be great for a weekend escape to a scenic location. 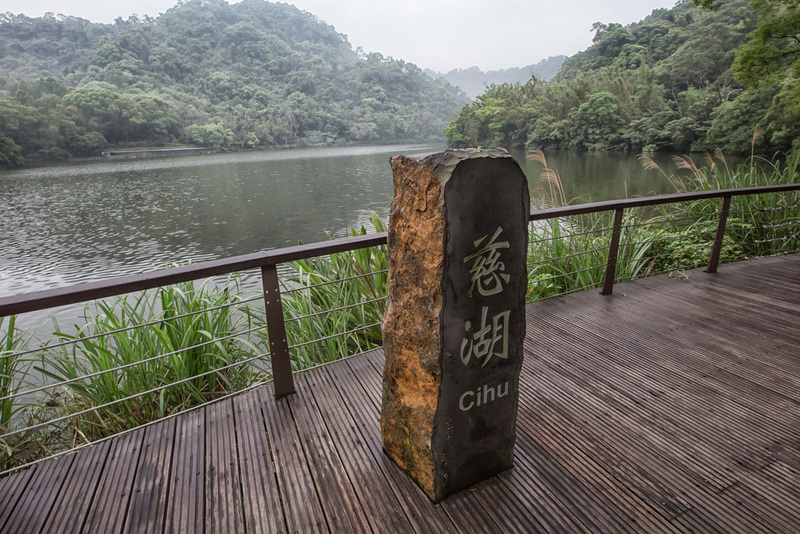 For most people, visiting Cihu is less about learning about history (as they study it in school) and more about enjoying nature. I wouldn't go so far to discount that there are obviously people here who look at Chiang Kai Shek and his son as great leaders. These people visit the mausoleum to show their respect to the former president, especially on special occasions and anniversaries. 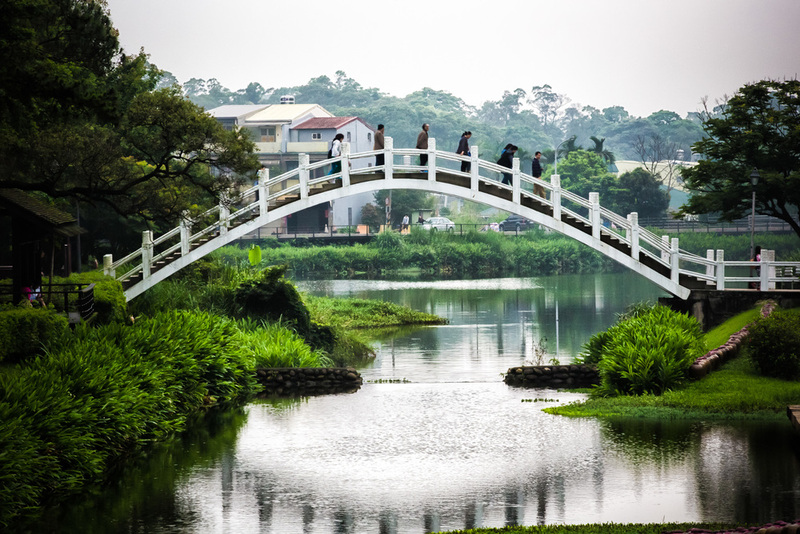 No matter what side of the fence you are on when it comes to Chiang's legacy, the park is a learning experience for the history of modern Taiwan and China from the 1900s onward. The mausoleum is situated a short walk from the park in a beautiful Chinese-style house that was designed to look like Chiang Kai Shek's former home in China. Chiang's body lies in state in the main greeting hall of the building and is guarded at all times by the honour guard of the Republic of China military. The mausoleum is a stark contrast to that of Mao Ze Dong's (毛澤東) in China which is kind of eerie - Chiang's marble sarcophagus doesn't display his body and the room is quite simple with only a few ROC flags, a portrait and a Christian cross in front of where the body lies rather than the grandiose mausoleum for Mao in Beijing. If you want to visit the mausoleum, it is requested that you respect the dead and bow to the former president, or at least show respect in your own way. I showed my respect by not taking pictures of his sarcophagus and the room he lies in - I'm sure quite a few tourists have snapped some shots of the marble coffin and the room he resides in, but I didn't feel comfortable doing that. If you are in Taoyuan and you can't think of anything else to do, send me a message and I'll give you some suggestions for places to visit. If you can't reach me, you can always stop by Cihu and waste an hour or so.